Wakfu is an online fantasy MMORPG developed by Ankama Studios and its final open beta test just recently came to an end in preparation for the final version set for release February 29th. The latest patch just out this month has provided us with some changes to its gameplay and community and with the prejudice of Dofus aside, we’ll take a look at some points and features that await the future players of this game. Once you have downloaded the game and chosen a server, you will be given a choice between 14 classes (previously 12) that you can customize and power up throughout the game. Players can save and level up more than one type of class that they prefer. Customization of the character may seem very limited but this will not matter much later on as equipment will eventually change your character’s appearance. After choosing your preferred class, you will be introduced to the world of Wakfu together with a short tutorial to its gameplay, battle sequences, ecology and community. There is also a short history about the world of Wakfu and Dofus but it’s wholly irrelevant. All classes have their own pros and cons and the tactics to be used for combat vary accordingly. Each class has 25 available spells to power-up, yet not all of them are practical and effective in battle so you’ll find yourself repeatedly using the same set of spells, especially if you’re still early in the game with only 6 Wakfu Points. In other words, climbing the Wakfu ladder could be a struggle, especially to lone newbies. Either way, it is all up to the player to use an effective strategy that will maximize the power of his chosen class. Battle controls are quite neat with keyboard shortcuts provided for every spell; usage of these shortcuts is significant for acquiring speed bonuses during attacks. The four corners in the map signify the four nations that you can choose to be part of. After learning the basics of the game and familiarizing yourself with how your class works, you can choose to join one of the four nations: Ankama, Bonta, Sufokia and Brakmar. Every nation has a unique clan member to guide you through the laws and whatnots of your nation and from hereon, you can commence PvP battles against players from other nations (or even players from your own nation if you want to be an outlaw). After choosing a nation though, you won’t be able to transfer to any other nation any longer, though you can still visit other nations through canons or boats scattered all over the map. The turn-based battle sequences for Wakfu are rather simple and easy to understand but can seem to become a drag in the long run. After a few days in the game, it could be very repetitive and boring, especially if you’ve only managed to level up a number of spells to put to good use. If you want to level up and maximize these spells, you’d have to slowly and patiently grind your way to kingdom come.The increased experience progression rate in the recent patch is also a very bad idea. Monsters of the same level as your character are difficult and give very little EXPs to level up. The fun part in every battle however, lies behind your own strategic planning because every placement choice and spell choice could either make or break you in combat. Engaging in team-based battles or PVPs also lessens the boredom. In this way, you get to challenge both A.I. and real players and face opponents with different combat strategies. Of course, it’s always more fun with a guild or a set of friends to help you through and to minimize the frustration in grinding. Unlike usual MMORPGs, there are no NPCs to provide you with quests in Wakfu. Instead, there is a player-driven ecology system where you kill mobs then harvest their seeds to kill more mobs. Monsters don’t just regenerate on their own in Wakfu. A harvesting profession lets players keep this balance and a Clan Member in every area informs you if he’s running out of creatures for everyone to kill. Every character can learn more than one profession. Gathering or crafting professions let you produce items that you can trade for Kama,(the game’s currency) which you can later on use to buy high-level equipment and other important items. Learning and leveling-up a profession is fun and easy and gives you a break from all the frustrating monster-grinding needed to be done, though it can take quite a long time before you can craft anything of value to other players. This process joins the cycle of the Wakfu world: grinding, leveling up, harvesting/crafting produce to sell for Kama to be used to buy equipment then grinding again. Reaching the maximum level cap of 200 sounds near to impossible with the extremely slow pace of the game, but with patience, anyone can power up at their own pace. 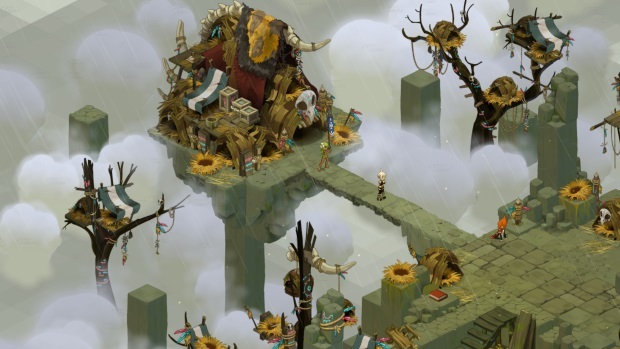 The absence of NPCs in Wakfu makes the overall experience a stark contrast to other MMOs. Some players like how they can just focus on leveling-up instead of running on errands. Some players however find the absence of quests demotivating. Wakfu does not give players much reason to go on and keep wanting to progress deeper into the game because there is nothing else important to do but fight. The entire system seems more circular than directional and some players might find themselves quitting early on. For one thing, Wakfu’s latest patch on graphics is nothing but eye-candy with smooth, clean designs accompanied by a charming musical backdrop. Area decorations could still be improved though to achieve a more distinctive look to every different place in the map. The new zoom-in function is handy and the overall visual appeal gets a two-thumbs up. Wakfu’s gameplay seems enjoyable enough for a wide range of audience, but I think it’s trying to target a younger market with its playful designs, simple mechanics and cutsie-packaging. Players looking for the usual MMO challenge could get bored with this one though because somehow, it doesn’t have much of that element that will motivate its players to keep on playing. It lacks any other things to do aside from just grinding and harvesting (lack of quests etc. ), the rewards and sense of satisfaction it gives to players after completing a difficult task is very minimal, and the rate of player-progression is painfully slow and frustrating. But with Wakfu being a massive-multiplayer-online game (with online being the keyword), interacting with other players will surely make the game more exciting. The system of its community is very healthy and looks extremely promising so play and mingle with other players instead of going solo. Wakfu was constantly evolving through its long beta test to cater to every gamer’s satisfaction. And despite some flaws (that I’m sure they are working on as of the moment), I think the game still has a lot of potential to be a great MMORPG. The game is launching next Wednesday with a freemium type of model so players can get a taste of the action before signing up for premium membership. I suggest if you have a good group of friends that like tactical combat games, to hop in together because the fun factor goes way up with friends on this one.